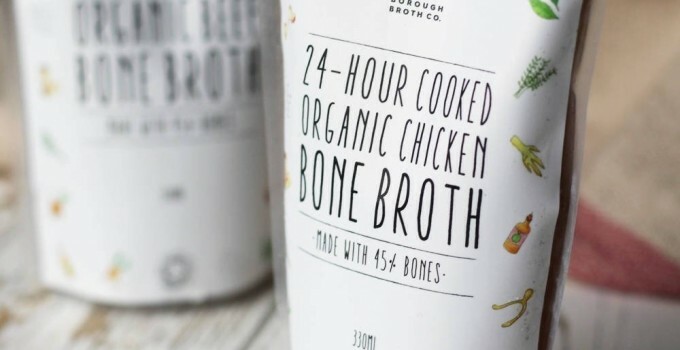 Founded by Ros Heathcote back in May 2015, the Borough Broth Co. are an artisan Bone Broth Producers. The company stemmed from Ros’ passion for making Bone Broths, but discovering that sourcing quality bones combined with finding the time to to make it was not always possible for people. We believe Bone Broth is one of the oldest foods around, it is nourishing and gentle on the digestive system. It is excellent drunk on it’s own, but also as a cooking base stock or broth in cooking. What is key for us as a brand is to ensure we source every single one of our ingredients from the best producers we can find in the UK. Our Beef is exclusively from an Organic 100% Grass-Fed Beef Farm in Somerset, our chicken is from 3 different Organic Free Range farms in the UK. We use organic British onions and carrots, and the finest organic herbs and seasoning. Finally we use British spring water in all of our Broths to ensure the cleanest tasting product. There are no preservatives, no heat treatment, no flavourings, no MSG and no nasties added to our Broths. We also use an extremely high bone:water ratio ensuring that our Bone Broths are premium, with a home-made level of quality. There’s no watering down, and no skimping! The best way to tell its quality is because it goes all jelly-like. We’re always coming up with new and wonderful ways to eat our broths.